Slow leaking underfloor pipes are guaranteed to wreck the look of an expensive tiled floor and this is exactly what had happened at our client’s house in the village of Shipdham. The problem occurred in the Kitchen and due to the slow nature of the leak it was some time before the problem was diagnosed and repaired. 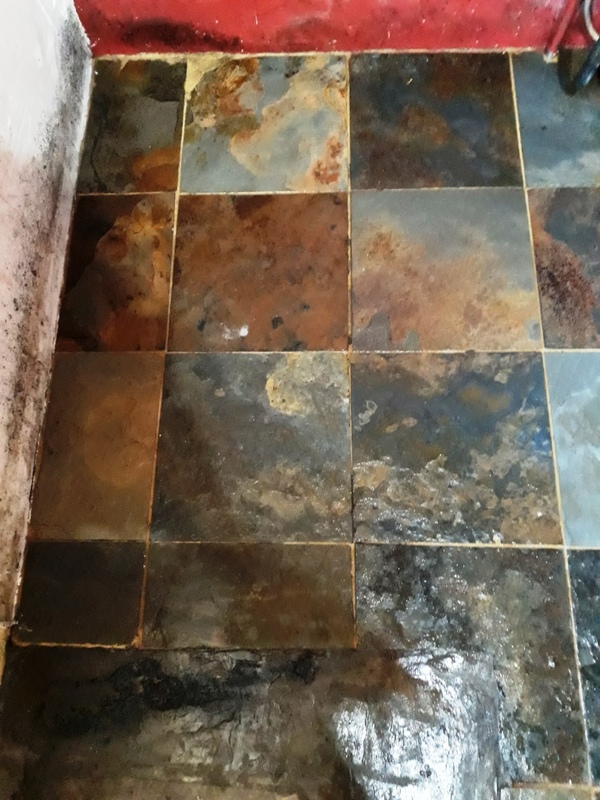 This resulted in a huge damp problem affecting the riven Chinese Slate tiled floor, damaging the sealer and resulting in white efflorescence salts being regularly deposited across the whole area. The old kitchen units had been removed and the floor partially excavated to access and repair the leaking pipework, after which a new section of slate tiles had been re-laid. The new and the old sections were noticeable, and part of my job would be to clean the old tiles to a standard where they would blend in with the new. 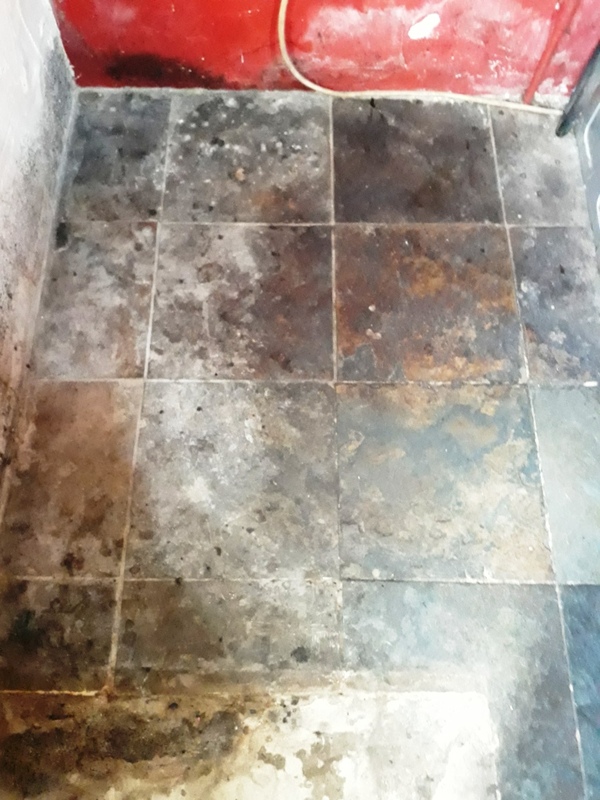 The first job was to deep-clean the floor using a strong solution of Tile Doctor Pro-Clean mixed with a small quantity of Tile Doctor Remove and Go, which would help to dissolve the damaged sealer. This poured onto the floor and left to soak in for ten minutes before being scrubbed into the slate with our rotary machine fitted with a brush attachment. This brush scrubs right into the uneven surface of the tiles and makes light work of what can be quite a physical job. This process releases a lot dirt and old sealer from the tile which is effectively removed using another machine that gives the floor a power rinse at the same time. The grout lines and parts of the riven surface which were still soiled were cleaned by hand using angle head brushes and Tile Doctor Oxy-Gel, which is a concentrated version of Pro-Clean in gel form which makes it a lot easier to contain in a small area. Having satisfied ourselves that the floor was finally clean, we left it to dry thoroughly overnight with assistance from our dehumidifier. On our return the following day, we damp tested the floor and found that the moisture content was a little higher than we would have liked and this would certainly cause a problem with the standard Tile Doctor acrylic sealer which is water based. In our experience water-based sealers are often only successfully applied if the conditions are ideal and the moisture content of the stone is very low. We chose, therefore, to use a slightly different product in the form of Tile Doctor Seal and Go Extra which is microporous and has a higher acrylic solids content than the standard product, making it ideal in situations where dampness in the tile is an issue but the client wants a sheen finish to make daily maintenance easier. Six coats of Seal and Go Extra were applied in total, the result had the sheen finish the client wanted and the sealer enhanced the different colours in the slate in the process. The sealer will provide excellent on-going protection and being a fully breathable sealer, it will not be impacted by any damp issues as the floor dries out completely over time.